MANCHESTER City boss Pep Guardiola has denied his team suffered a hangover from its Champions League success over Barcelona after dropping home points again in a 1-1 draw with Middlesbrough to lose top spot in the English Premier League. City defeated Barca 3-1 in midweek but despite scoring first through Sergio Aguero - his 150th goal for the club - could not hold on for the win. Boro's Martin de Roon headed home powerfully in the 91st minute after City dominated the game, having 19 shots in the first half alone. "Not really, we started amazing and played really good in the first half," Guardiola said when asked if the performance suffered because of the Champions League win. "We created six or seven chances and didn't score. "We did absolutely everything to win the game, controlled the game and in the last minute we concede a goal. It is a pity." Chelsea took advantage of City's slip-up with a crushing 5-0 win over Everton moving it a point clear at the top, although Liverpool and Arsenal can both overtake the Blues with wins on Sunday night (AEST). Antonio Conte's men were in sparkling form with Eden Hazard leading the way with two goals. 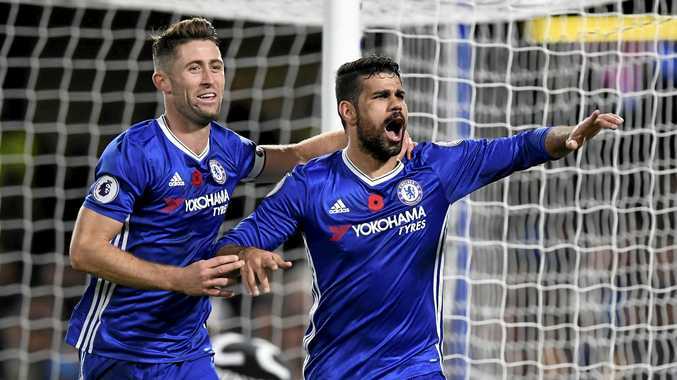 Marcos Alonso, Diego Costa and Pedro completed Chelsea's biggest victory under Conte and sixth-placed Everton's heaviest defeat by far since Ronald Koeman became manager in the close season. "When you win in this way, it's fantastic," Conte told BT Sport. "It's a pity that now we have to stop for the international break." Chelsea has now won its past five games without conceding a goal. Sunderland, meanwhile, has won its first game of the season with a 2-1 success at Bournemouth. After Victor Anichebe equalised Dan Gosling's early goal, Sunderland survived the sending off of Steven Pienaar to score a winner thanks to Jermain Defoe's penalty. The win wasn't enough to take the Black Cats off the bottom, although they are now level with Swansea, which plays at home against Manchester United on Sunday night (AEST). Crystal Palace lost 3-2 at Burnley - its fourth straight defeat - as the home side scored a late winner. Welsh international Sam Vokes and Iceland's Johann Berg Gudmundsson had put Burnley 2-0 up but Palace equalised through sub Connor Wickham and record signing Christian Benteke from the penalty spot. Ashley Barnes put Burnley back in front in added time before Palace had another chance to draw level but Andros Townsend hit the post. Stoke City extended its unbeaten run to six games with a 1-1 draw at West Ham.